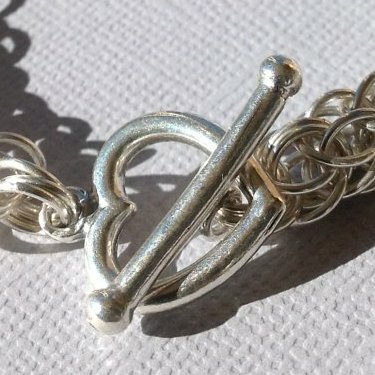 This sterling silver chainmaille bracelet is truly beautiful-an eye catcher! The viperscale chainmaille weave is an advanced and unique design, producing a one-of-a-kind bracelet. This bracelet is handmade with lots of attention and love. 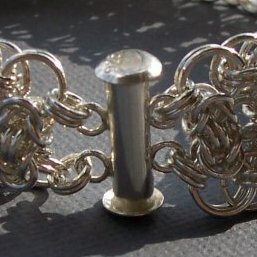 This one-of-a-kind chainmaille bracelet looks simply amazing in all sterling silver. It will look amazing on your wrist! It is fine jewelry, lovingly handmade. I had been admiring this design for a long time but never made it until late summer 2015 when I decided to enter the State Fair competition. I had also never seen this bracelet in sterling silver until now. It is a beautiful design and deserves to be made in precious metals. 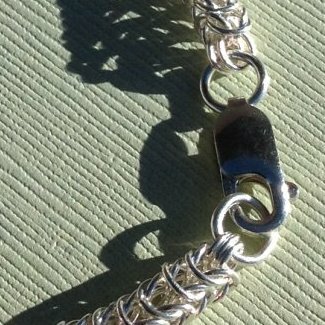 This chainmaille bracelet definitely sparkles and mesmerizes. I’m very happy with the way it looks. I particularly like the 3 criss-crossing rings down the middle.